You are currently browsing the tag archive for the ‘Superman’ tag. ‘Nix on Hypnotricks’ starts with some Eastern hypnotist called Prof. I. Stare, who needs a human victim. ‘Nix on Hypnotricks’ is a genuine gag cartoon and shows the Fleischer studio in top form. Who would have thought the two brothers would be out of business within half a year? No sooner were the Fleischer brothers removed from their own studio, or their stars Superman and Popeye were fully put to the war effort. No other American cartoon stars featured in as many propaganda shorts fighting the foe. Superman stars in five, of which ‘Japoteurs’ is the first. In this entry three Japanese spies try to steal the world’s largest bomber on its test flight. Of course, Lois flies along, and both she and the plane have to be rescued by Superman. ‘Japoteurs’ is an unfortunate cartoon, which adds to the idea of a fifth column of Japanese within The United States, making every Japanese person suspicious. Indeed, due to this type of paranoia, during the war no less than 110,000 Japanese Americans, including women and children, were put into internment camps. 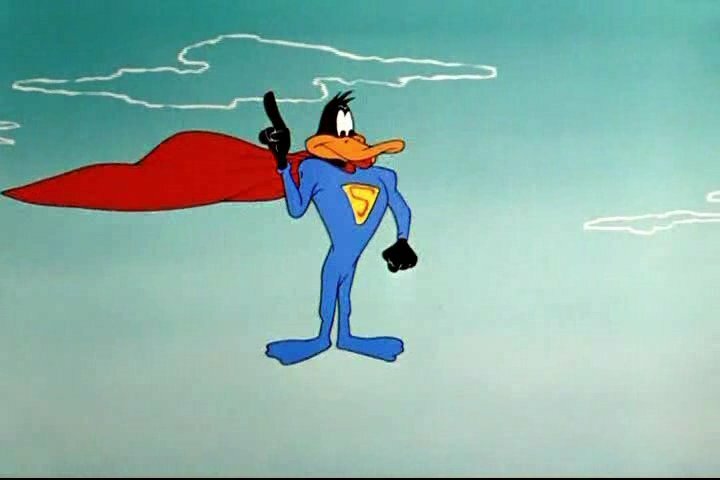 ‘Stupor Duck’ is a spoof on the Fleischer’s Superman cartoons, a series that had ended 13 years before, and was earlier parodied by Chuck Jones in ‘Super Rabbit’ (1943), starring Bugs Bunny. This time Daffy is “Stupor Duck”, who, overhearing a television program, seeks for the non-existent villain Aardvark Ratnick, seeing his deeds in everything. Daffy, for example, rescues a submarine from ‘sinking’. 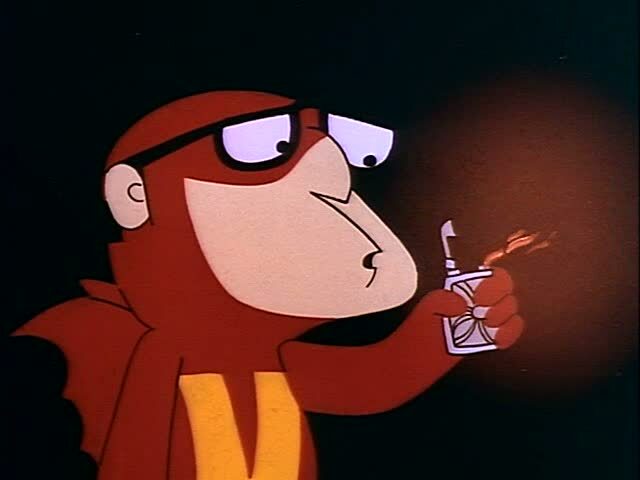 The best part of the cartoon is its opening sequence which perfectly parodies the Fleischer’s opening sequence. The rest of the cartoon is unfortunately hampered by mediocre timing. ‘Vip mio fratello superuomo’* is Bozzetto’s second feature, and it a great improvement on his first (‘West and Soda‘ from 1965). The designs are bolder, the pace is higher, the timing sharper, and the story more original. The film starts rightaway with a hilarious history of the VIP superheroes through time. It then introduces our heroes, the superhero SuperVIP and his weak little bespectacled brother, MiniVIP. They end upon an island where a super-villain plans to turn mankind into brainless consumers. The result is a very nonsensical superhero story, told to a great effect, with the minimum of means and very limited animation. It also shows Bozzetto’s aversion against consumerism, a theme he would expand upon in his masterpiece ‘Allegro non troppo’ (1976). Unlike that latter feature, ‘Vip mio fratello superuomo’ remains virtually unknown. This is a pity, for this funny film deserves a wider audience. ‘Fast and Furry-ous’ is the very first Road Runner cartoon. The short lays out the plan for all other Road Runner shorts, introducing the Road Runner, and the coyote, and their habitat: a desert canyon landscape covered by freeways. Like all following Road Runner cartoons it consists of blackout gags, involving mail orders, strange inventions, explosives, trucks, boulders and cliffs. 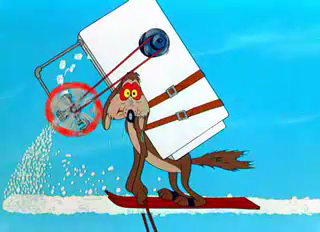 It differs from the other Road Runner cartoons, however, in that only one of the products the Coyote purchases (the Superman suit) is made by ACME. It also features quite elaborate designs of Wile E. Coyote. In later cartoon his looks would become more streamlined. ‘Fast and Furry-ous’ introduces the excellent silent comedy of the Road Runner cartoons, second only to the Tom & Jerry series, and very welcome in an age in which animated shorts became more and more dialogue-driven. Although we would call the series after the Road Runner, the speedy bird is essentially a one-dimensional character: being invincible, the Road Runner knows only one cheerful expression, and doesn’t do much more than running really, really fast and going ‘beep beep’. So when this wonderfully enthusiastic character looks to us for sympathy, when confronted by boulders, trucks, explosions or one of the immensely deep canyons of his homeland, he gains it, for we understand his frustrations and sympathize with him wholeheartedly. These Oliver Hardy-like looks into the camera belong to the highlights of the series, and it is the silent comedy of the Coyote’s facial expressions that makes the Road Runner cartoons such fun to watch. Indeed, when given a voice, as in the Bugs Bunny cartoon ‘Operation Rabbit‘ (1952), the character becomes much less interesting; too pompous, too self-aware to gain the sympathy he would silently get. The four Bugs Bunny-Coyote combination shorts therefore never reach the comic success of the best of the Road Runner cartoons. 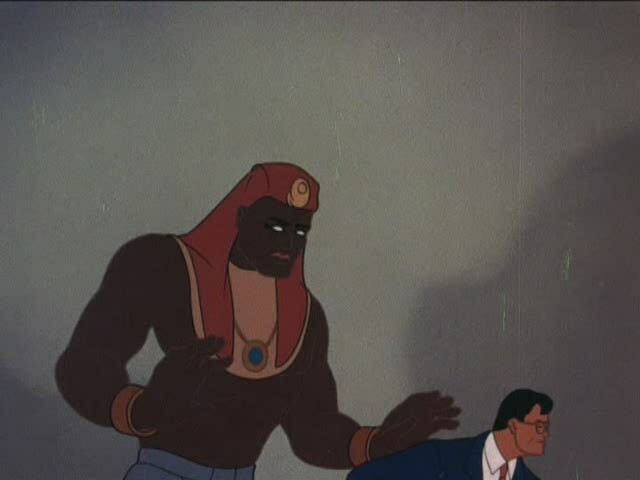 The Superman cartoon ‘Jungle Drums’ blends the war theme with the adventure setting of ‘The Mummy Strikes‘. This time the setting is a vague African island, populated by scary natives who are under control of some mysterious Nazis. They shoot an American plane out of the sky, which contains Lois and some secrets concerning the American fleet. While the natives try to burn Lois, Clark Kent/Superman only arrives just in time to save her. Superman beats the Nazis, while Lois warns the US Air Force against Nazi submarines threatening the fleet. The last shot is that of an angered Hitler listening to the radio how his plans were frustrated. 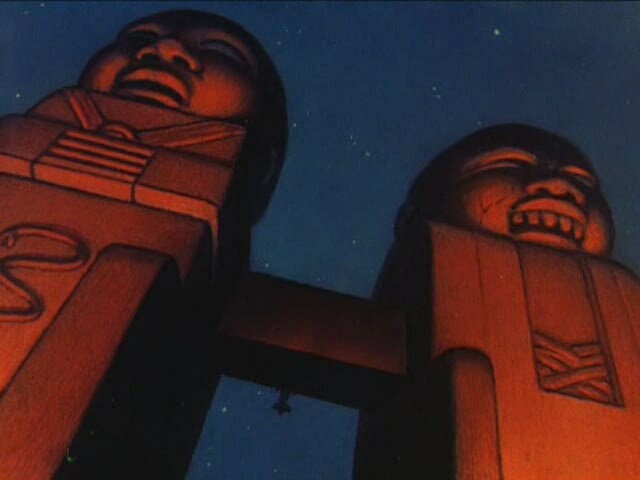 Although this short, like most Superman cartoons, contains a weak and badly build story, it stands out for its great shots of scary natives, with their original camera angles, stark color designs and large shadows. The end result is arguably Superman’s best film. With ‘The Mummy Strikes’ the Superman series entered the realm of the adventure movie, albeit with rather unsuccessful results. One doctor Jordan is mysteriously killed in the museum and Clark Kent is invited to investigate the murder. Lois follows him secretly. After a very lengthy explanation, four gigantic mummies come to life, but Superman defeats them in an all too short battle. This finale is not in proportion to the boring explanation scene preceding it. In all, ‘The Mummy Strikes’ is one of the weaker entries in the Superman series, because of this ill-constructed story. Luckily, Superman’s next adventure, ‘Jungle Drums‘, would be much better. 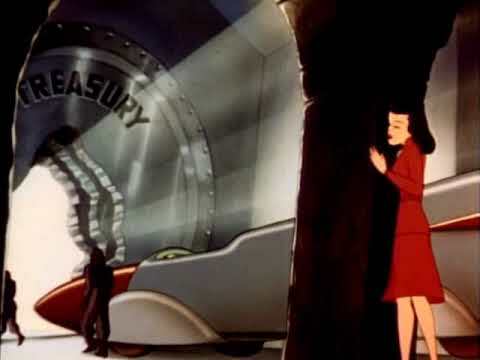 To the previous Superman film: Destruction, Inc.
‘Destruction Inc’ was Superman’s third war cartoon, after ‘Japoteurs‘ and ‘Eleventh Hour‘ from earlier that year. Like ‘Japoteurs’ it features saboteurs on American soil, a paranoid idea, well-fed by government propaganda. This time the danger comes from the inside: some American gangster saboteurs threaten a munition plant. Lois discovers them at a factory, but she’s captured and put inside a torpedo. Luckily Superman is in the neighborhood, not as Clark Kent, but as an elderly general. However, he only arrives just in time to rescue Lois from a certain death in a short that belongs to Superman’s more entertaining films. ‘Destruction, Inc’ opens with a shot of someone being murdered. Such a shot would open the next film, ‘The Mummy Strikes‘, too. ‘Eleventh Hour’ is Superman’s second war cartoon, after ‘Japoteurs‘ from earlier that year. It’s one of the earliest World War II cartoons dealing with Japan. In this short Superman himself is the saboteur, destroying ships, bridges, airports and tanks in Yokohama, Japan. 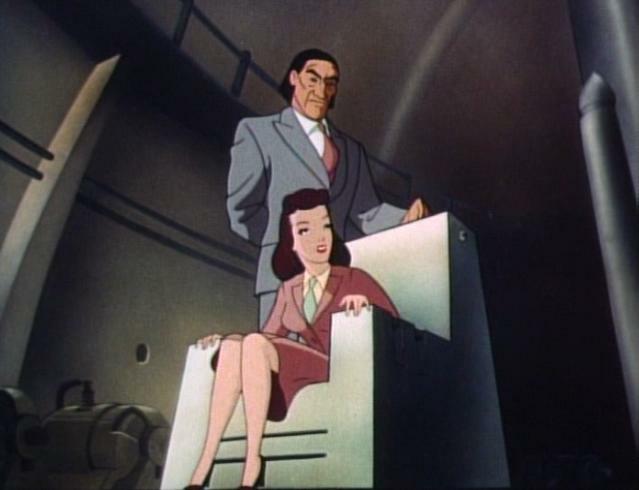 The furious Japanese capture Lois, who stays with Clark Kent in Japan, and threaten Superman to execute her if he doesn’t stop his sabotage. Superman reads this ultimatum all but too late and he’s only just in time to rescue Lois from the firing squad. Lois returns home, but Clark Kent stays behind, implying that Superman keeps on doing his sabotage work, a message that must have been comforting to the home-front. The story of this cartoon is quite original, if not very well-constructed. Unfortunately, by now Superman has been reduced to an expressionless figure, making him a boring character to watch. To the next Superman film: Destruction, Inc. In an original twist to the Superman formula, a sneaky fake Superman steals jewelry for his gangster boss. Meanwhile Lois and Clark have to report an opera performance. Luckily, the fake superman is there, too, pickpocketing the attendants. Superman captures his look-alike and his boss. ‘Showdown’ clearly has the most original story line of all superman cartoons, and this makes the short arguably the best entry of the series. At least the cartoon contains the funniest line in the series, when Lois makes Clark Kent the sarcastic remark “fine Superman you‘d make”. In ‘Terror on the Midway’ Lois is reviewing something as mundane as a circus, when a small monkey accidentally releases a titanic gruesome gorilla. The gorilla follows her, while Superman’s busy putting other animals back into their cages. He rescues Lois and captures the gorilla, but it remains unclear how he stops the fire that has started, too. ‘Terror in the Midway’ is one of those fortunate Superman shorts without a villain (see also ‘The Arctic Giant’ and ‘Volcano‘ from the same year). However, it also shows Fleischer’s ambivalent realism: it contains some generic Fleischer thirties children designs, which by 1942 really look old-fashioned, but there are also some rare close-ups of Lois and Superman, which add to the drama. The staging, too, is superb, with some spectacular shots. 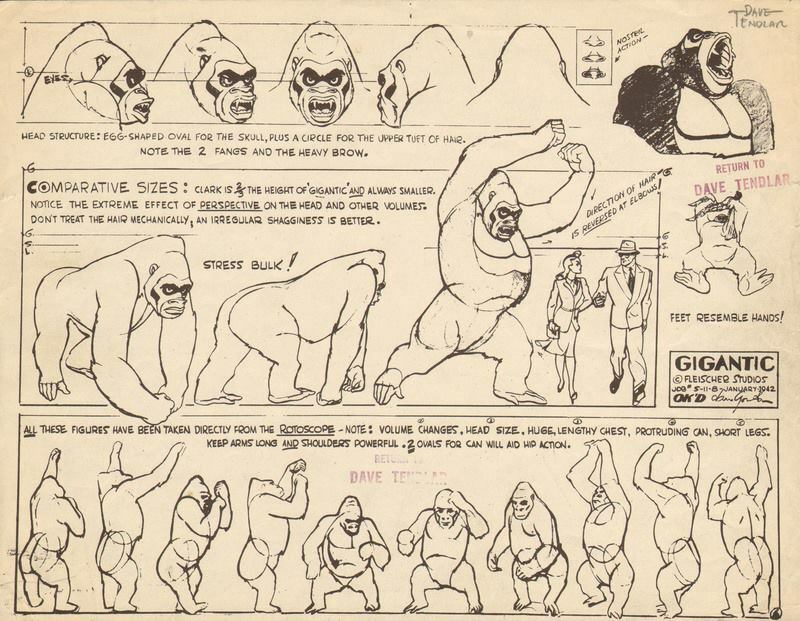 The gorilla looks like a typical King Kong-like monster, despite the fact that its model sheet was partly based on rotoscoped movements of real gorillas. 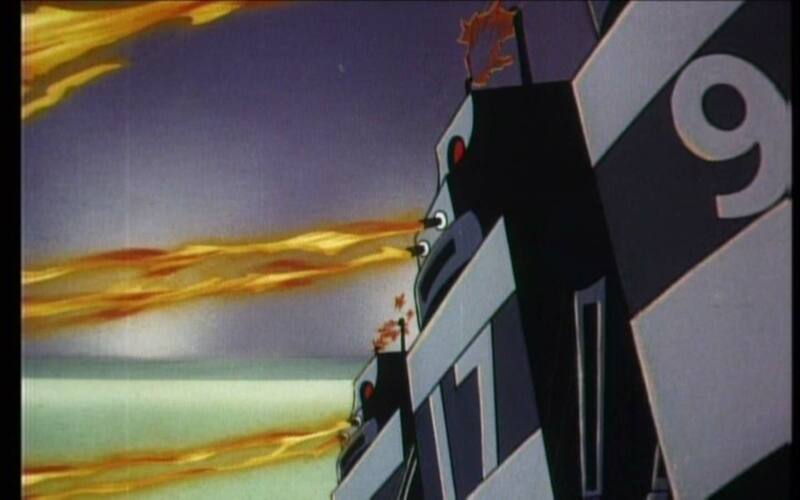 Apparently, Bambi-like naturalism was wasted on the Fleischers animators. Unfortunately, ‘Terror on the Midway’ would be the last Superman cartoon made by the Fleischer studios, before Paramount stole their crew to form their own Famous Studios. Indeed, it was the very last film the Fleischer brothers made together, ending an era that had begun 27 years earlier. In the aptly titled short ‘Volcano’, a dormant volcano is starting to erupt again on the island of Monokoa. 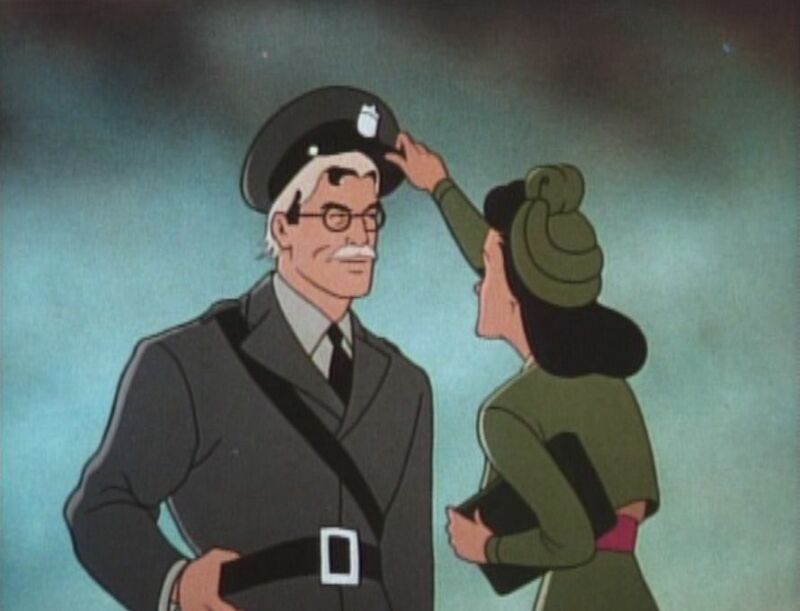 Daily Planet reporters Lois and Clarke are present, but Lois steals Clark’s press pass to work alone. She sneaks away to visit the volcano by herself, but when she’s up on the volcano, it suddenly erupts. 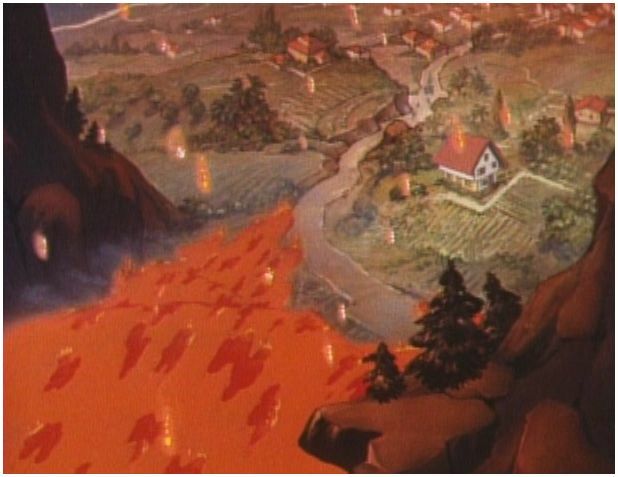 Superman saves her and the village below by redirecting the lava to the other side. Together with ‘The Arctic Giant’ and ‘Terror on the Midway‘, ‘Volcano’ is noteworthy for featuring no villain, let alone an evil scientist. 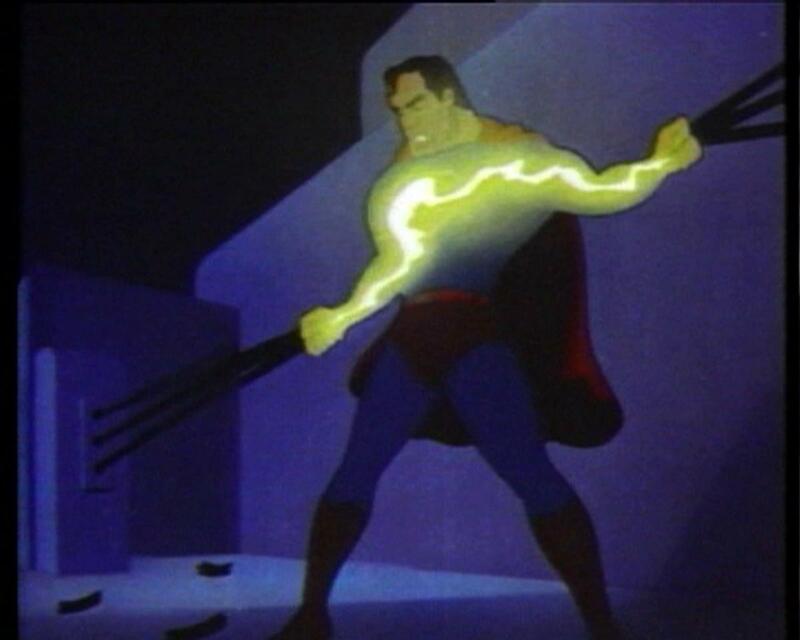 Moreover, this Superman short probably contains the most spectacular effect animation within the series in its terrifying depiction of floating lava. 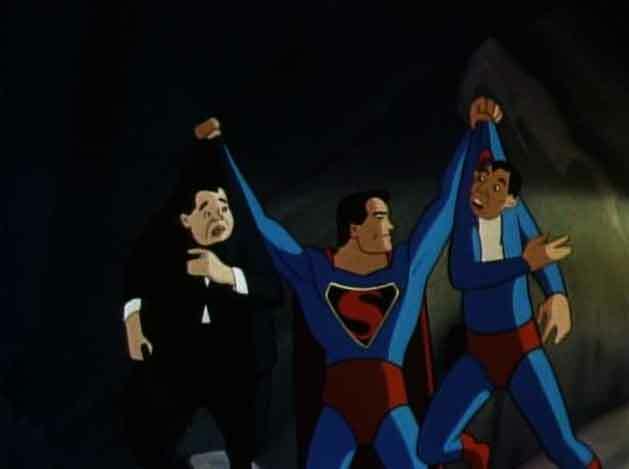 In the seventh Superman short New York is threatened by – whattaya know? – an evil scientist. But this evil scientist is more original than all the others before him: he is of Native American origin and he claims Manhattan for his own people. Nonetheless, like all other evil scientists before him, he has a machine. His ridiculous machine causes earthquakes by using electricity. Oddly enough, the scientist first makes his threats at the Daily Planet. And when he returns to his secret hideout, Lois, of course, follows him. In his laboratory below sea level the scientist makes Lois watch the destruction of the city. In any case the result is yet another routine entry. In ‘The Magnetic Telescope’, the sixth entry in the Superman series, yet another evil scientist attracts ‘flaming comets’ with a ridiculously looking magnetic telescope. Superman, of course, saves the day. He first tries to stop the comet itself (which falls remarkably slowly), but surprisingly, this is too much for him, and his antics produce more offshoots, which destroy bridges and such. So, in a bright moment he restores power to the magnetic telescope, telling Lois to put the machine on ‘reverse’… (how Superman came to know how the telescope works, we’ll never know…). The whole story is amazingly ridiculous, especially because the story is told in the most sincere fashion. It shows the Fleischer studio’s discomfort with realism all too clearly. Although it’s only the fifth Superman cartoon, ‘The Bulleteers’ already feels so formulaic, it’s depressing. Like in Superman’s first two cartoons some evil scientists with some crazy machine threaten the city, Lois gets into trouble, superman saves her and Clark Kent discusses her story in the newspaper with her. This time the novelty is that we’re watching three villains. The evil trio has invented a ‘bullet car’ (part car, part plane, part rocket), with which they destroy the police headquarters and a power-plant by flying through it. Lois foolishly climbs aboard the car, but Superman drags her and the villains out of it in flight. 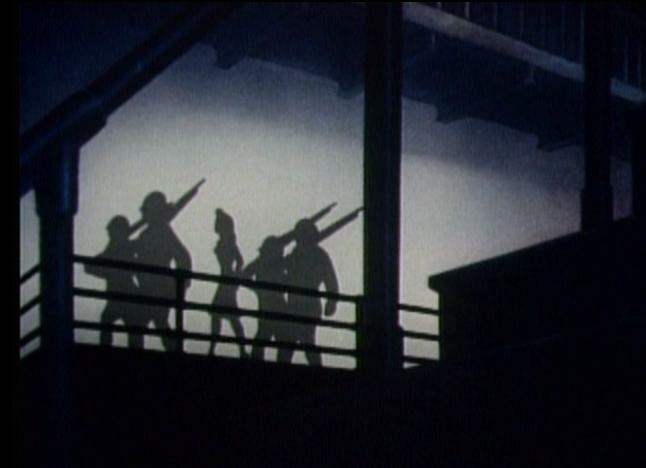 The spectacular angular staging and effective lighting in this cartoon cannot hide the fact that with ‘The Bulleteers’ the series had reached an inspirational low point story-wise. Later in 1942, the war became a major theme in the Superman series, which fortunately led to more inspired story ideas. ‘The Mechanical Monsters’ was Superman’s second cartoon, and it is almost a copy of the first one. Again, there’s an evil scientist, this time a jewel thief, who robs jewelry using huge flying robots. Again, Lois gets herself into trouble by her curiosity and, again, after Superman has saved the day, Lois and Clark discuss Lois’s article in the newspaper. This copying of a formulaic story format is the main weakness of the Superman series, and it’s saddening to see it already happening in the second cartoon. Luckily, the execution of the formula is better than in the first cartoon. This evil scientist is drawn more realistically, and the sidekick has gone. The elaborate intro has been shortened into a few seconds, leaving more room for the story. 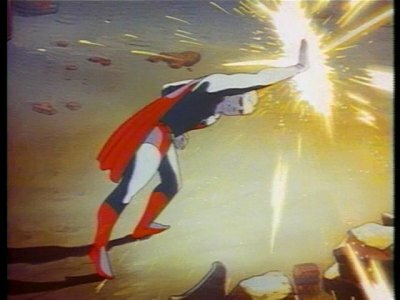 Moreover, watching Superman knocking down giant robots is more enjoyable than watching him defeating a ray. ‘Superman’ is the first Superman cartoon, the very first cartoon series to feature realistic characters, and the Fleischer Studio’s most ambitious cartoon series. Superman, of course, was based on the comic strip hero who made his debut in 1938. 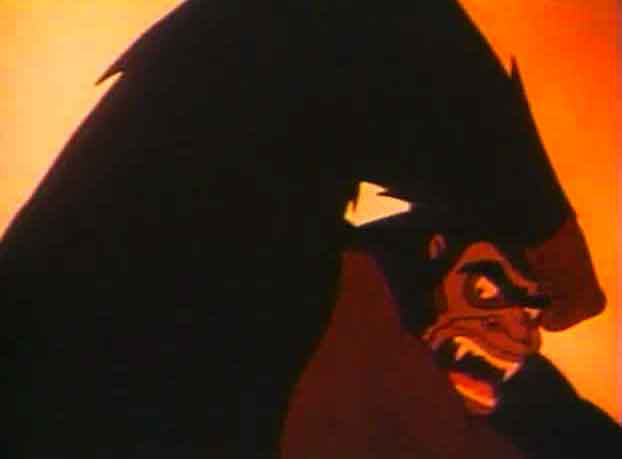 For his screen debut, the studio made a long introduction of the character, which lasts almost two minutes. 4) an ending with Lois and Clarke reading a newspaper article written by Lois Lane. Despite elaborate shadows and special effects, this first realistic theatrical cartoon (not counting the works by Winsor McCay) hasn’t aged very well. The scientist is still half cartoony, and he has an animal sidekick, which mimics his moves. The rest of the characters are drawn realistically, but also stiff and expressionless. They look forward to the wooden realistic cartoons of the TV era. The character was very popular, however, and inspired a couple of parodies, most notably the Bugs Bunny cartoon ‘Super Rabbit’ (1943). It’s ironic that after Popeye the Fleischer again had to rely on a character created elsewhere to achieve success. Unfortunately, this meant they couldn’t exploit Superman’s popularity as much as they could have with a character of their own. Superman would star in seventeen cartoons, all from 1941-1943, nine by the Fleischer Studios, and eight by its successor, Famous studios. In 1943 the series was dropped because it was too costly to produce.